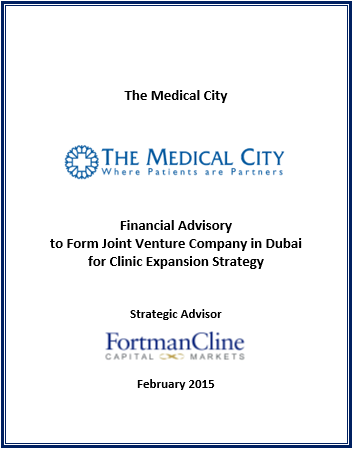 Fortman Cline advised The Medical City (TMC) in forming a Joint Venture Company with the Sama Group (Kuwait) to establish and operate a clinic chain in the Gulf Cooperation Council (GCC). The JV opened its first clinic in Dubai under the TMC Proser brand of clinics and it plans to expand to other GCC cities such as Abu Dhabi and Kuwait City. TMC already has over 30 clinics in the Philippines and its expansion into the region allows the company to bring its quality clinic care to Overseas Filipino Workers (OFW). The GCC has the largest OFW population with over 2mn as of 2012. 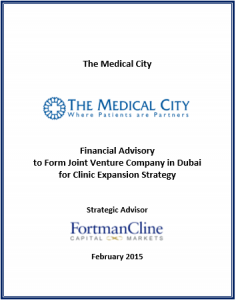 This entry was posted in Firm News on November 4, 2015 by FortmanCline.